The Texas Public Health Coalition (TPHC) revealed its top five health priorities for the 2015 legislative session to legislative staffers Tuesday. The coalition, founded in 2006 by the Texas Medical Association, is made up of more than 30 organizations dedicated to advancing disease prevention and health education. In 2014, more than 119,000 Texans will be diagnosed with cancer, and almost 45,000 Texans will die from cancer. Public education, screening, and early detection are essential strategies in our state efforts to reduce the incidence of cancer. The Cancer Prevention and Research Institute of Texas (CPRIT) is leading the charge against cancer in Texas, funding groundbreaking treatment discoveries and education and screening initiatives, especially targeting underserved populations. TPHC recommends: Support state funding for the Breast and Cervical Cancer Services program and the Texas Cancer Registry, and maintain future support for CPRIT. Vaccinations are one of the safest and most cost-effective ways to prevent infectious diseases, individual illness, and community outbreaks. Properly vaccinating all children born in the United States is estimated to prevent 20 million cases of disease during their lifetime and 42,000 premature deaths. Texas has made much progress in vaccinating young children, but coverage rates for adults and those under the age of 3 years must improve. Recent outbreaks of pertussis and measles underscore the importance of improving Texas’ vaccination rates. TPHC recommends: Improve access to information on immunization coverage and information on the incidence of disease, and strengthen the state’s immunization registry by preserving consented data in Texas' immunization registry for college age students. Two out of three Texas adults are overweight or obese, and 37 percent of Texas children aged 10-17 are overweight or obese. By 2030, obesity will be responsible for thousands of new cases of cancer, diabetes, arthritis, stroke, and hypertension and cost Texas businesses more than $30 billion. TPHC recommends: Preserve and support expansion of chronic disease prevention funding and support evidence-based policies that address healthy environments and obesity as they relate to physical activity and access to affordable, healthy foods. 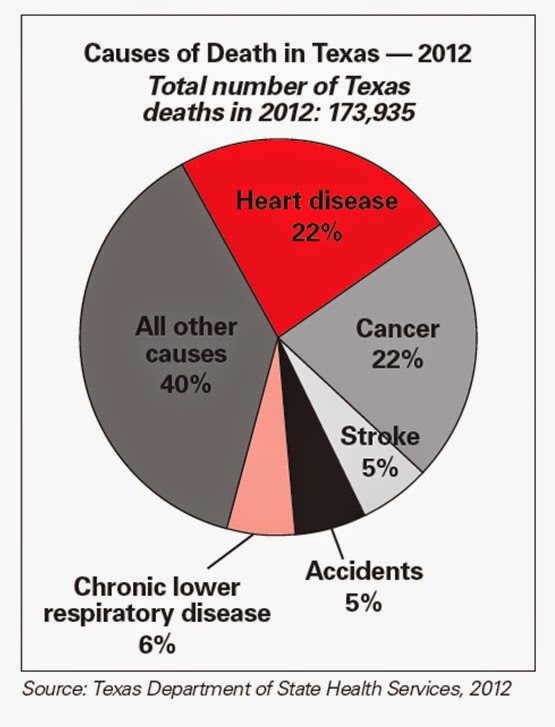 There is no bigger factor in preventable death and disability in Texas than tobacco use. 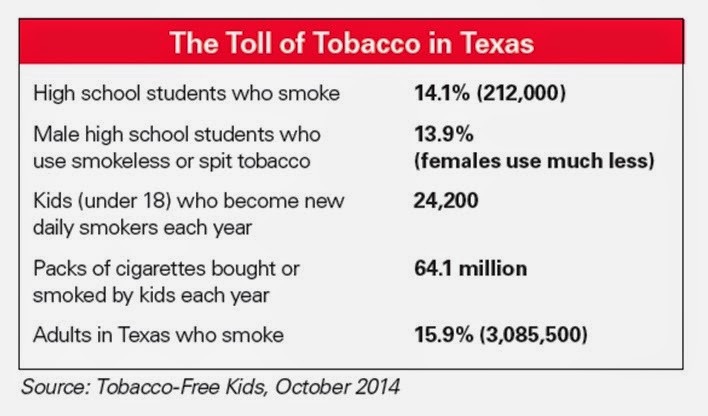 Texas still has a higher rate of death attributable to smoking ― 273 per 100,000 ― than the rest of the United States. To protect their residents, each year more Texas cities adopt ordinances to reduce exposure to secondhand smoke. At the same time, new products ― like electronic cigarettes ― are attracting the interest of tobacco users and minors. TPHC recommends: Support adequate funding for comprehensive, statewide tobacco control and for regulation of e-cigarettes as tobacco products, including prevention of youth access. 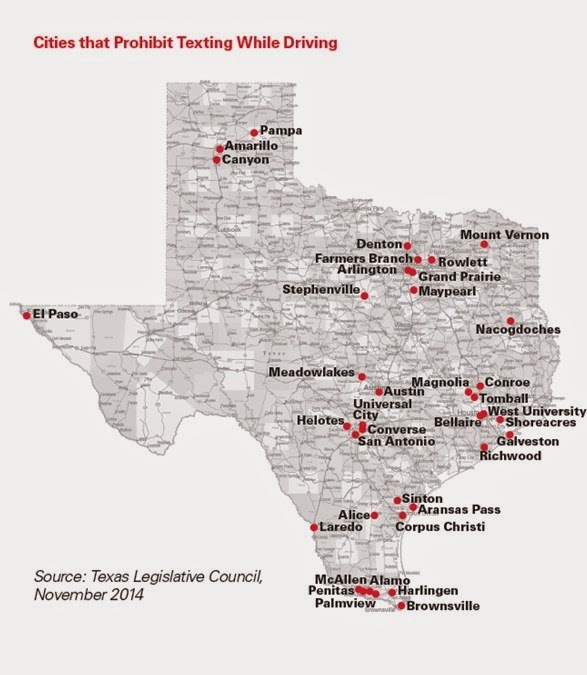 One in five traffic crashes in Texas is caused by a distracted driver. In 2013, that added up to more than 95,000 crashes and 460 deaths. Text messaging is the riskiest form of distracted driving, yet the percentage of drivers who text while driving has risen in recent years. While an increasing number of cities have implemented a variety of restrictions on distracted driving, there is no comprehensive approach. An overwhelming majority of the public, 94 percent, support state laws banning texting or emailing while driving. TPHC recommends: Increase driver responsibility, stop texting while driving, and educate the public about the dangers of distracted driving.